When I am in the flow of artmaking and the flow is going very well, I close my eyes when I am going to sleep and I see many visions. Because I have used this black paper for so long I believe my art guides are feeding me the beauty of their dreams. 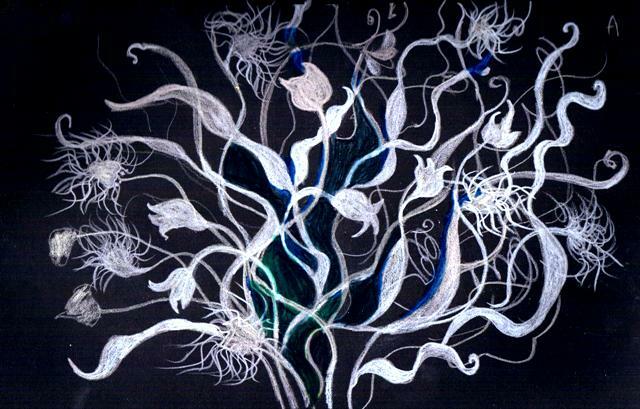 This came to me as a twisting, writhing, dancing bouquet of white flowers on an an inky dark background. Previous PostTwo Composition AssignmentsNext PostI’m All Out of Long’s Farm Raspberry Jam! Wow! I hadn't seen this one! I am all out of black paper, but you are really reminding me how luminous night visions on black can be! This is a full-boded composition full of life and energy. I wonder if the pollinators see something like this with their special vision? Ohhh, now that is a thought. Wouldnt that be crazy to know how bees see? What about snakes, alligators, lizards?